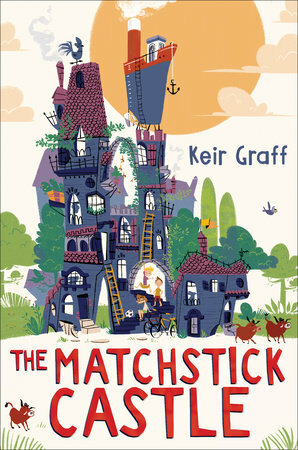 With The Matchstick Castle, Keir Graff has written the perfect summer read for kids, although anyone who likes adventures with larger-than-life families will love this book no matter what the season. In narrator, soon-to-be-sixth-grader Brian Brown, Graff creates a believable, every-kid voice, drawing you into the story immediately. Instead of a summer filled with soccer tournaments, staying up late and eating junk food, Brian finds himself stuck in Boring, Illinois with his straight-A cousin Nora and his Uncle Gary, who needs subjects to beta-test his educational computer software, Summer's Cool, on. But, a lost soccer ball and a jog into the nearby woods changes Brian and Nora's summer in more ways than they could have imagined. Hidden in the woods is the Matchstick Castle, a rambling, ramshackle, hazardous seven storey house with a boat perched a top the highest point. Living in the Matchstick Castle are five brothers, the great-grandsons of the architect, Archibald McCulloch van Dash, who happened to find, then hide too well, a chest filled with Confederate gold. Ivar, Kingsley, Roald, Montague and Dashiell van Dash, along with Dash's son Cosmo and Anthea, his missing aviatrix wife, are all adventurers and explorers, traveling by boat, foot, on the fiercest seas and darkest jungles. Kingsley von Dash has even explored what he calls "the depths of the most frightening place: the human brain," and documented it in his book, The Cerebral Conundrum. The brothers van Dash aren't good at more practical things like keeping the Matchstick Castle livable and safe, answering the mail or using a computer, and when Brian and Nora stumble into their crumbling abode, they also stumble into a few serious problems. The Matchstick Castle is just days away from being torn down by the city of Boring for numerous code violations and Uncle Kingsley, who has been missing for over a year, sends word that he is trapped - inside the Matchstick Castle! Graff does a marvelous job in creating the Matchstick Castle, making it feel just real enough to be believed and imagined, but packed with an array of oddities like a mushroom garden and a candlepin bowling alley along with a grand ballroom and a massive library with a hilarious cataloguing system with directions like, "On the third or fourth shelf above the spot where Roald spilled the bowl of Artillery punch at Christmas" instead of call numbers. And of course, many many staircases in varying degrees of usability and safety. While Brian and Nora lead the battle to save the Matchstick Castle (among many battles, one of which involves giant Amazonian killer wasps) the van Dash family steal the show. Graff wraps up the story nicely, with some surprises and discoveries that help the cast save the day - and the castle. I hope that Graff has another book planned with this setting and these characters - I need to know more about the remarkable van Dash family.